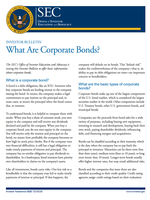 MEMOFIN - What Are High-yield Corporate Bonds ? - L'information financière que vous ne trouvez nulle part ailleurs ! What Are High-yield Corporate Bonds ? While they generally offer a higher yield than investment-grade bonds, high-yield bonds also carry a higher risk of default. What is a high-yield corporate bond ? What are some key risks in high-yield corporate bonds ? How can you invest in high-yield corporate bonds ? What should I research before investing ?